Just like you, your canine companion's health depends on the proper blend of minerals, vitamins, meats, vegetables, essential fatty acids and antioxidants. Natural Planet Organics has taken all the guesswork out of feeding your dog, leaving you with the peace of mind that you are making the best healthy choice for your dog. This is not just another organic dog food. Ingredients: Organic chicken, chicken meal, organic oats, organic barley, organic peas, natural turkey and chicken flavor, chicken fat (preserved with mixed tocopherols and citric acid), organic brown rice, organic flaxseed, calcium carbonate, tomato pomace, organic sunflower oil, potassium chloride, dried brewers yeast, salt, minerals (zinc proteinate, iron proteinate, copper proteinate, cobalt proteinate, manganese proteinate, selenium yeast), blueberries, choline chloride, organic alfalfa meal, organic sunflower seeds, organic pumpkin seeds, organic carrots, broccoli, vitamins (vitamin A acetate, vitamin D3 supplement, vitamin E supplement, niacin, d-calcium pantothenate, thiamine mononitrate, pyridoxine hydrochloride, riboflavin supplement, folic acid, biotin, vitamin B12 supplement), chicory extract, lecithin, lactic acid, sage, L-ascorbyl-2-polyphosphate (source of vitamin C), yucca schidigera extract, garlic, calcium iodate, rosemary extract, yeast culture (Saccharomyces cerevisiae), dried Enterococcus faecium fermentation product, dried Lactobacillus acidophilus fermentation product, dried Aspergillus oryzae fermentation extract, dried Trichoderma longibrachiatum fermentation extract, dried Bacillus subtilis fermentation extract. 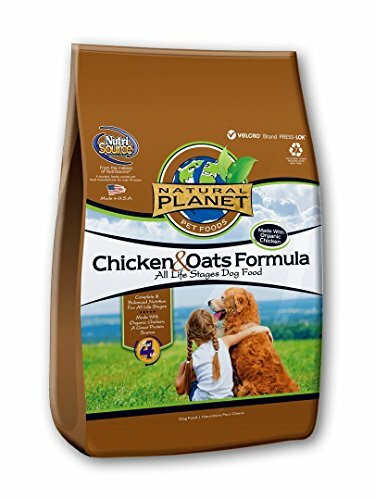 Natural Planet Chicken and Oats Formula Dog Food is formulated to meet the nutritional levels established by the Association of American Feed Control Officials (AAFCO) Dog Food Nutrient Profiles for all life stages except for growth of large size dogs (70 lbs. or more as an adult). If you have any questions about this product by Natural Planet, contact us by completing and submitting the form below. If you are looking for a specif part number, please include it with your message.